The Optec Intelligent Filter Wheel brings to astronomy a new level of sophisticated equipment for the benefit of the astro-imager. 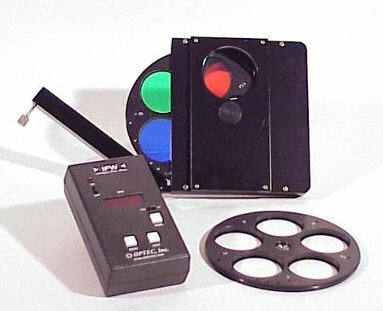 Astro-imaging in this age of astronomy requires the use of many color filters and the management of these filters during an observational session can sometimes be confusing. The use of the wrong filter could easily spoil an otherwise successful imaging run. The Optec IFW has the ability to determine the identification (ID) of a particular wheel and apply that wheel ID to a preprogrammed set of filters. The names, not just position numbers of these filters, are read on the eight character display and are also available to the camera operating software via a serial interface using a simple command structure. Up to 5 different filter wheels can have separate IDs and each wheel can have up to 5 filters for a total of 25 identifiable filters. 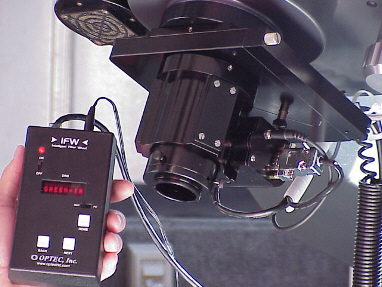 The IFW filter wheel can easily be removed from the IFW system without tools or removal from the telescope. A hinged door is secured by a single captive thumbscrew. Once opened, the wheel can be extracted and another inserted in its place. The entire process takes only a few seconds. See the short movie on the "More Info" page. Hitting the HOME switch on the hand control or invoking the HOME function in the operating program will set the wheel to position one and bring up the available filters for that wheel. The IFW is not intended to be mounted close to the camera. The large filter size allow for mounting some inches away without vignetting the CCD. Dust specs on filters mounted close to the CCD will cause shadows which are hard to flat field out if the filter registration is not pixel perfect. When the filters are far removed from the CCD, the shadows are eliminated. Because the call for control using the SBIG pulse protocol has diminished greatly, the SBIG-PC switch on the front of the control box above the HOME button has been removed. The control box is set for PC serial control as default but can be set for SBIG pulse control by moving a jumper on the circuit board. This is easily done by removing the back cover of the box to access the circuit board jumper. Besides saving a few pennies on the switch for Optec, there is one less item that can fail and cause connection problems. Optec,Inc. © 1996, 2013 | All Rights Reserved.